Dry to wet. Woods, forests, prairies, meadows, fields. This is a 3″ to 32″ long, prostrate, perennial forb that rises on numerous stems from a creeping rhizome. 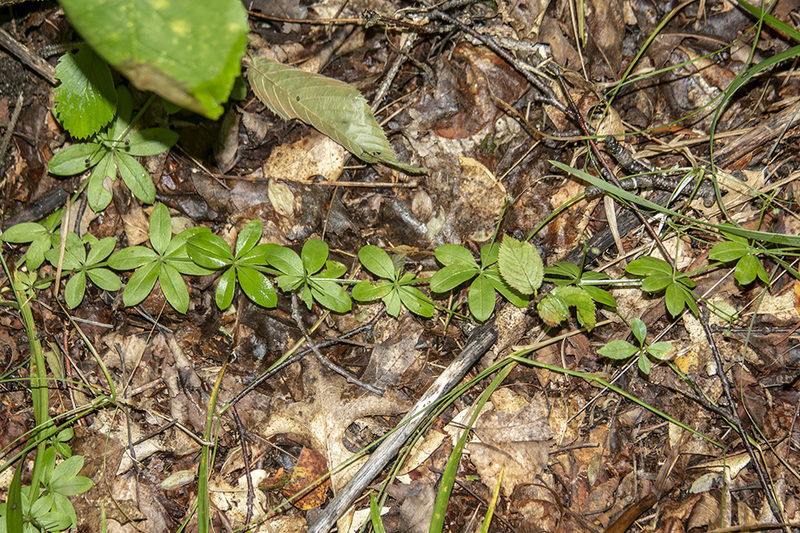 The stems lie flat on the ground (prostrate) or climb awkwardly on adjacent vegetation (scrambling). 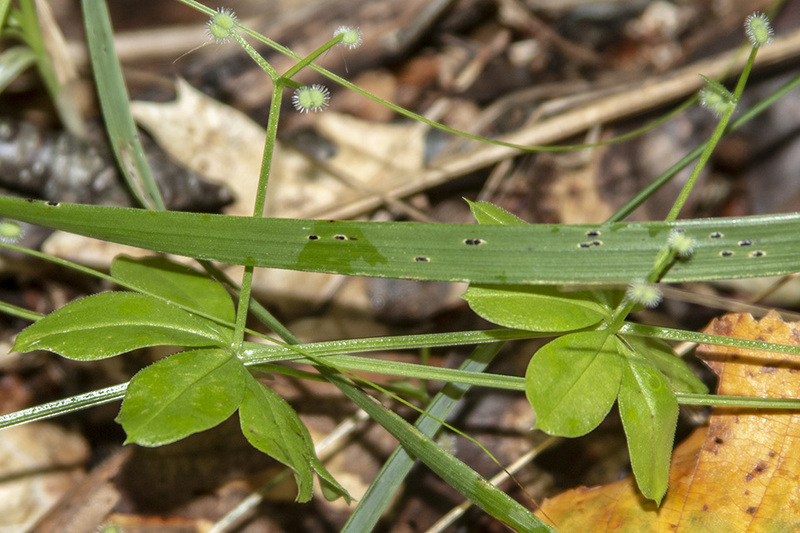 They are slender, weak, 4-angled, hollow, light green or reddish green, and usually unbranched but sometimes branched near the tip. They are usually rough with minute, stiff hairs. They usually also have hooked hairs at least near the base. The leaves are stalkless and mostly in whorls of 6. On smaller branches thay may be in whorls of 4. The blades are narrowly elliptic to reverse lance-shaped, ⅝″ to 2″ long, and up to ½″ wide. They have a single prominent vein running from the base to the tip. There is an abrupt, short, sharp, firm point at the tip. The upper surface is hairless. The lower surface is hairless except for rough, hooked hairs along the midrib. 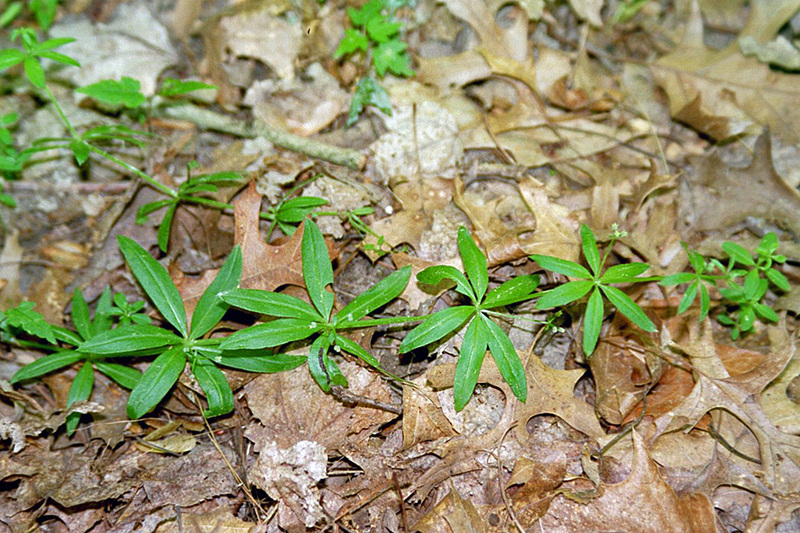 The margins are untoothed and have a fringe of rough, forward-pointing hairs. When crushed the leaves emit a vanilla odor. The inflorescence is 1 to 3 small, branched clusters of 1 to 3 stalked flowers at the end of the stem and rising from the middle and upper leaf axils. The flower stalks are often longer than the subtending leaves. The flowers are 1 ⁄16″ to ⅛″ wide. There are 4 greenish-white to white petals fused at the base into a short tube then separated into 4 short lobes with long-pointed tips. There are 4 short stamens and 2 short styles. At the base of the flower there 2 carpels. The carpels are joined together and are covered with hooked hairs. The fruit is a green, ball-like, 1-seeded capsule, joined in pairs and separating at maturity. The capsules are covered with hooked hairs.